This is a 4 X 960H Camera CCTV system from Lorex. 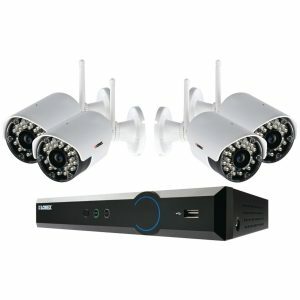 The system features a complete wireless system with a 500Gb hard drive and a DVR. Instead of cables the cameras have antennas which transmit the signal back to the ECO Blackbox DVR. The cameras have a transmission range of 500ft outdoors and inside the range is up to 165 ft. So you can record your footage, pause, rewind, erase and remote monitor. Set time scheduled recordings, continuous recording and motion detect recording. Stream live and watch from afar. Mac & Android devices are all supported. For more sophisticate remote monitoring options Lorex are offering a DDNS (Dynamic Domain Name Service) free of charge. The wireless transmissions are encrypted with Signal Guard & FHSS (frequency hopping spread spectrum) technology which monitors and reconnects weak signals that pairs the cameras with your receivers and DVR and also cuts out interference. The cameras are weatherproof and rated IP66 standard, plus they have infrared LED’s and combined with night vision mode offer a night viewing range of approx 135 ft. Enjoy the easy set up and forget about drilling cables through walls. Wireless transmissions free you of the chore of running cables to multiple cameras and working out the best angle to feed cables through intricate buildings without them being too intrusive. Now you don’t have to worry about slotting cables through concrete walls, binding them together and attaching them to walls and tricky surfaces. You don’t have to worry about getting the right length of cables or spending money on extending your camera range. You don’t need the internet to watch your footage, you can just run with your DVR. That way should your internet connection ever go down, you can still record footage directly on location. With wireless you install the camera and you are good to go. OR NOT>>You do need to attach a power cable, so be aware of that. The cameras have a vandal shield to protect the power cords from abuse and tampering. VGA & HDMI connections allow you to view on a computer or tv or professional monitor. The ECO Blackbox includes pentaplex operation, enabling you to view all the cameras at once, record, playback and also back up your video files, and also monitor your system from a separate location. So in summary it has all the advantages of a wired system – DVR, remote control, capture your footage on location- stream to the cloud, remote monitor. The major advantage is that you don’t have to run video cables to transport the camera feeds back to the DVR. Would have liked to have not needed to add power to the cameras, and rather have them battery powered. Just like an ARLO system. Then this would have been a complete wireless system. It might be fine in a house where you can place cameras near power sockets, but outside you are still going to have to work out a solution to run power cables to the cameras. Lorex have got this system right by adding a DVR although we would rather they stopped making SD systems and run with a HD system for enhanced clarity.